MORE than 150 junior footballers attended at an open day for a club in Wargrave. Wargrave Wolves held the event at the recreation ground, off Recreation Road. There were games, trophy presentations and a barbecue and hundreds of guests from around the village attended. 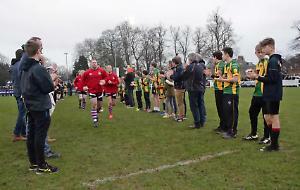 Club chairman Andy Meader said: “There were probably about 400 people in all and it was a really successful event. The weather stayed dry, which was helpful! “The kids played fun games before we did the presentations and we also managed to celebrate with beer and cake, which helped the club funds. “The club is going well. As well as having success on the pitch this season, we have had a lot of club trips to Wembley and the Madejski Stadium for kids and parents.